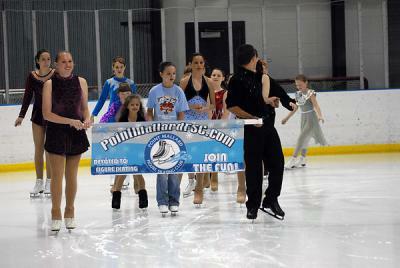 Over 70 competitive skaters from across Alabama and from the Memphis, Tenn., area will be in Decatur, March 2, 2013, for Blades in Decatur, part of the Alabama Grand Prix Basic Skills Competition Series. Hosted by the Point Mallard Figure Skating Club, the basic skills competition will be held at the Point Mallard Ice Complex. The event gets underway at 7:30 a.m. with an opening ceremony and a parade of athletes with competition beginning at 8 a.m. Competitive skaters ranging from children 5 years old to adults will be participating in the day-long competition. A United States Figure Skating approved Basic Skills Competition Series, the Alabama Grand Prix Basic Skills Competition Series is sponsored equally by the Point Mallard Figure Skating Club, the Skating Club of Huntsville, and the Birmingham Figure Skating Club. Blades in Decatur is the second of three events to form the Alabama Grand Prix Basic Skills Series #12 sanctioned under U.S. Figure Skating. The first event – Rocket City Junior Classic - was held in Huntsville on February 16 and the final event is Blades in Bama in Birmingham on March 16. The competition is open to the public and admission is free. For more information, call Heidi Langham at 256.654.3330 or visit www.pointmallardfsc.com.